Ok, so the Death Star in question set a land speed record among ground-based space stations like I recently won a handsomeness contest among all the people in my apartment nicknamed “Great White Snark.” That is to say: uncontested. 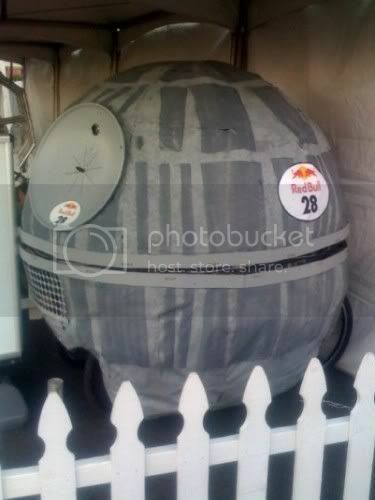 Regardless of its merits of momentum, the Death Star that competed in last week’s Red Bull Soap Box Race here in San Francisco deserves at least 10,000 Galactic Credits for its exuberant tribute to everyone’s favorite orb of planetary destruction. Thanks to my buddy Jay for the photographic evidence. …a 6-by-6-foot sphere held together by two mountain bike frames welded together and surrounded by a welded steel sphere. The sphere is wrapped in chicken wire and covered with gray landscaping paper. It seats two and also includes a small video camera with monitor. Understandably erratic race footage of the Death Star. But instead of a laser capable of destroying a planet, this weapon is a water cannon. The top half of the sphere also rotates and will blast unsuspecting spectators with water during the race. Prefer pictures to words? Yes, I suspected as much about you. Check out this video showing the construction of the Death Star racer and this race footage from the perspective of the water cannon’s “Death Cam”. Did they win the race?